Actually, i‘ve always had a weak spot for Kodak Retina Cameras. This goes back to a Retina I my uncle gave me a long time ago. The little camera had an uncoated 3.5/50 Schneider-Kreuznach Xenar lens and a body painted with black enamel that wore the scratches and blemishes of many years of heavy use. 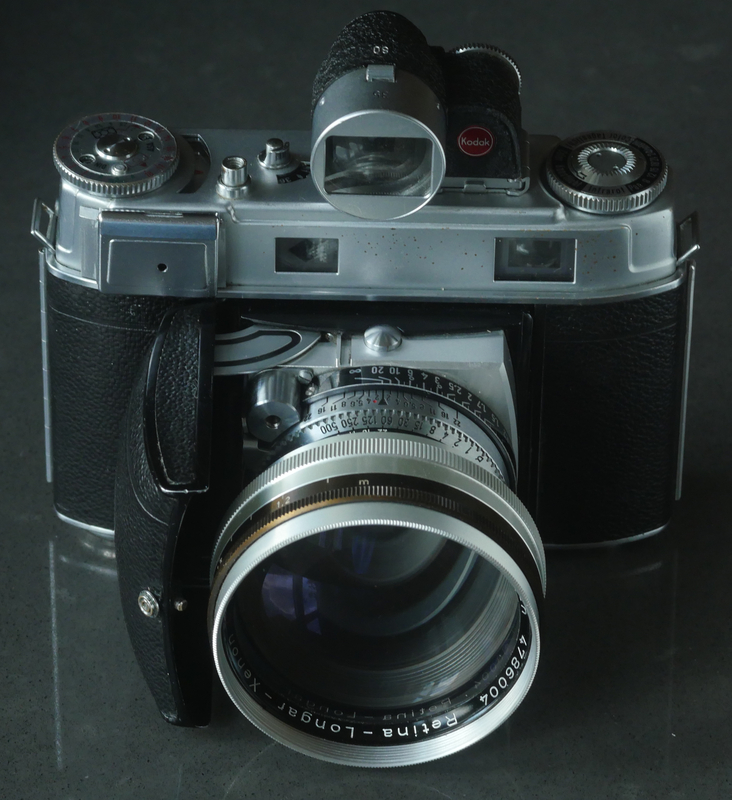 The fact that it lacked a rangefinder and the viewfinder was very small made focussing and framing some sort of guess work. But the little camera had character and i knew that my uncle, an avid mountaineer, had used it to document his ambitious hikes in the bavarian alps in the late 1930ies. Because of its light weight and small pack size it became my trusty companion on many motorcycle trips throughout Europe. It never let me down. Some decades and a digital revolution later (in which i partook rather enthusiastically with a series of Canon DSLRs and Panasonic’s Lumixes from GH1 to GH4), i had almost forgotten about the Retina when i spotted one of its younger sisters in the shopping window of one of the few color photo labs left in my home town of Munich, Bavaria. 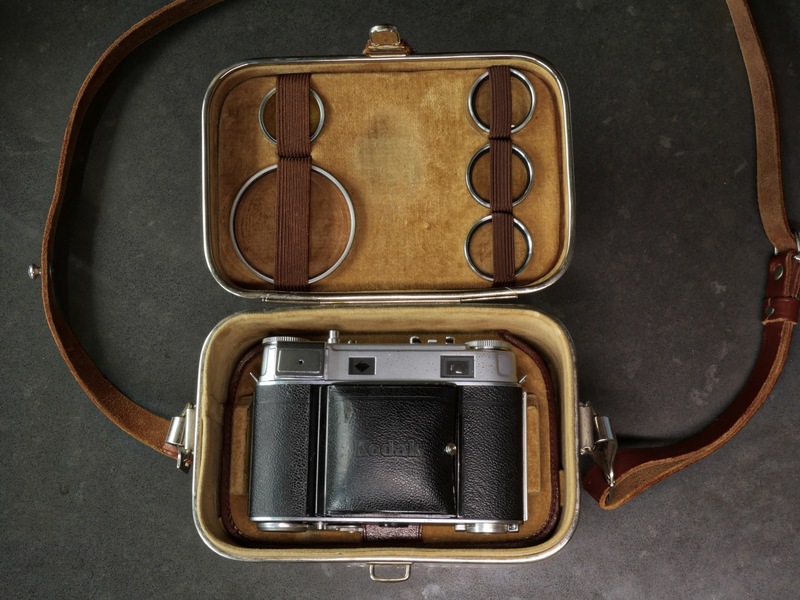 It was a beautiful Retina IIIc from 1955, made in Germany at the Kodak Nagel Camera Factory in Stuttgart. 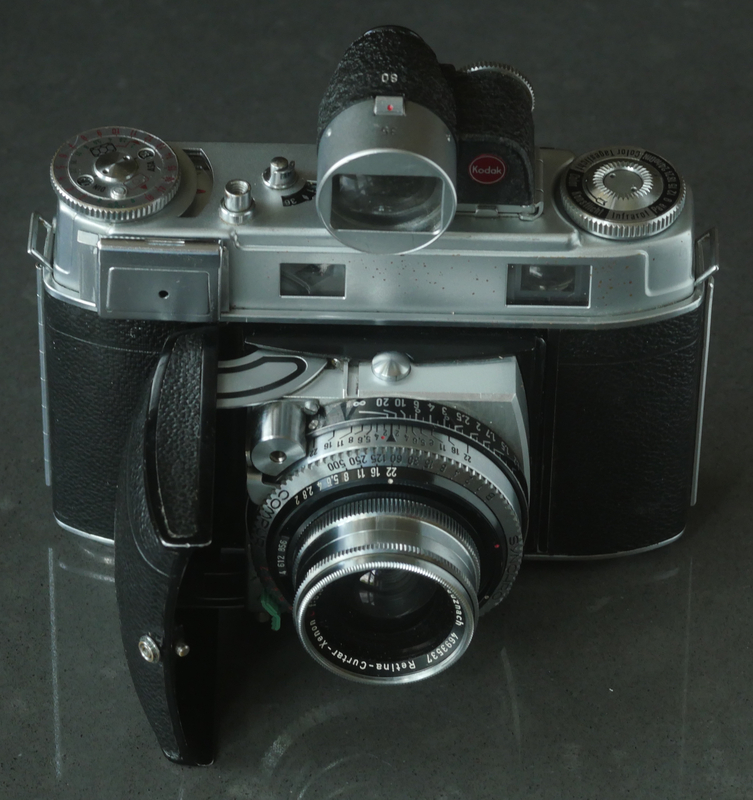 A perfect example for the 35 mm folding cameras of its era, it sports a 50 mm Schneider Xenon lens, a f 2.0 six elements design that optically plays in the same league as the older versions of a Zeiss Planar or a Leitz Summicron. 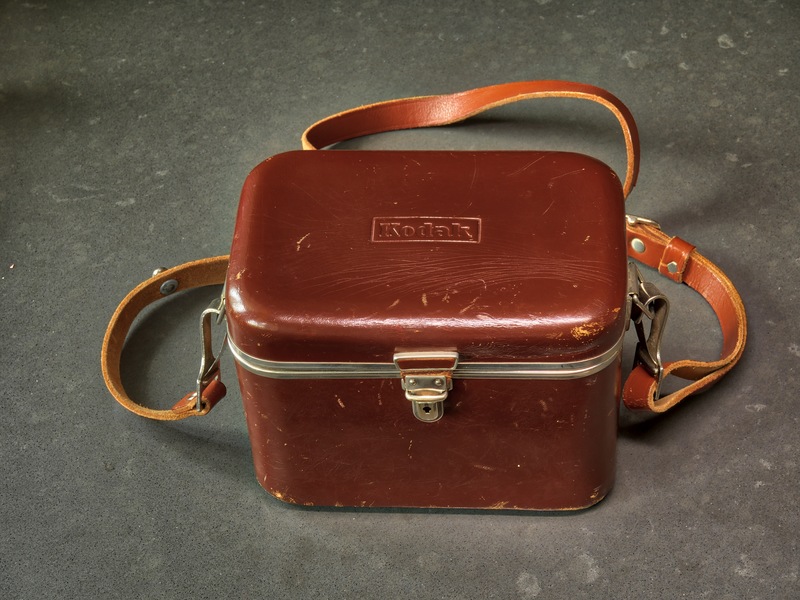 With it came a leather box shaped like a lady’s beauty case with the letters “Kodak” embossed in its lid and that kindled my curiosity. 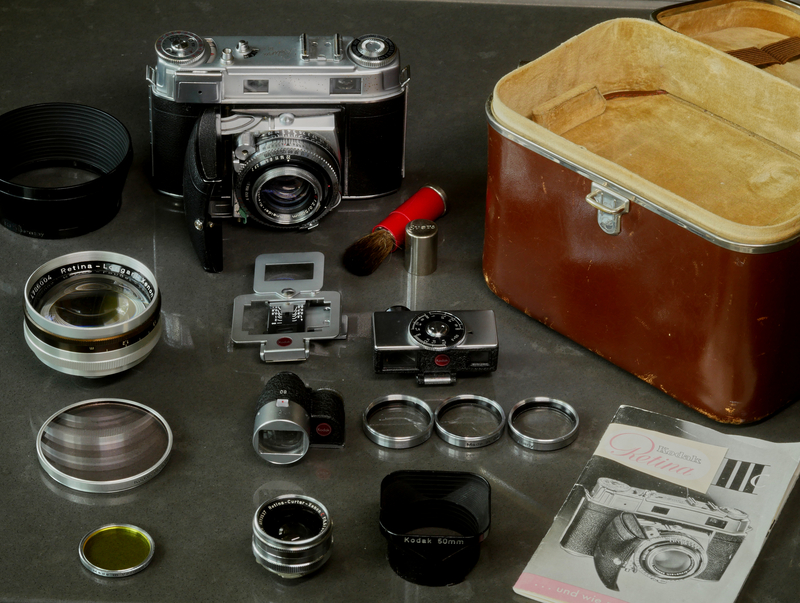 The “beauty case” was a custom made container that housed not only the camera itself, it also contained two supplementary optics that turn the 50 mm Xenon into a 35 mm wide angle respectively an 80 mm telephoto lens. These are not fully fledged interchangeable lenses because the rear part of the Xenon remains in the camera behind the leaf shutter and only the front element gets changed. If you want to use either of the lenses without guessing your field of view you need an accessory viewfinder that can be switched from 35 mm to an 80 mm. But this is not the only finder in the case. It has got two companions: A sports frame finder that can be adjusted to 50 mm or 80 mm and a special parallax correcting view- and rangefinder for closeup photography that is used with three closeup lenses also among the accessories. 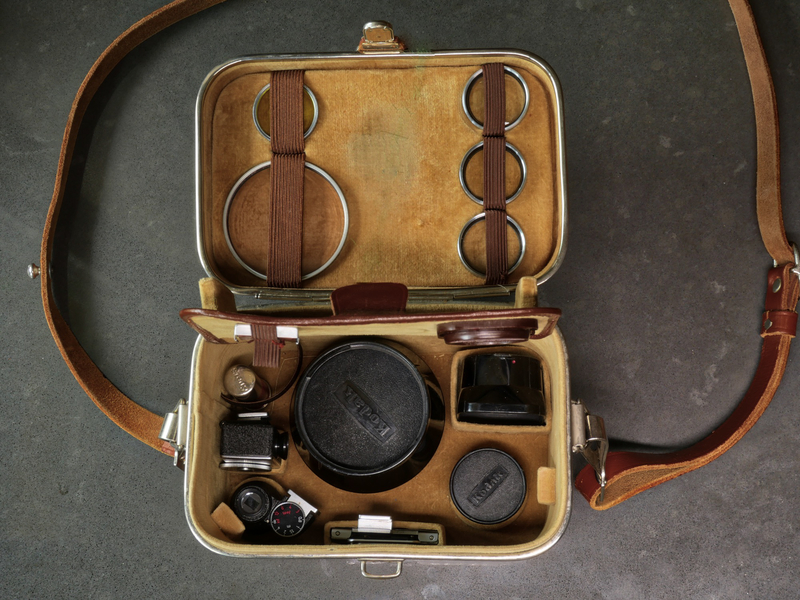 A set of filters and lenshoods and a little brush to keep the lenses clean rounds up this complete photographic system ingeniously packed into a small case about half the size of a modern small camera bag. Amazing. The price for all this equipment was delightfully low so i couldn‘t resist. I bought the little treasure chest, made myself familiar with its contents and the next day i took the Retina IIIc out into the streets. The camera has everything you need to take properly exposed and focussed pictures – a coupled range finder with a bright diamond shaped patch you have to match with the rest of the picture by moving a smoothly operating focussing knob and a selenium light meter that survived the onslaught of time and gives perfect readings more than half a century after it has been produced. Okay, using this meter is kind of complicated. It is a dual range system – in bright light a metal flap with a small hole in the middle restricts the amount of light reaching the selenium cell. So when the light is low you must lift the flap to let more light in. I think this is a good thing because selenium cells die when they are exposed to strong light for a long time. A little drawback of this construction is that it is a tad more complex than a single range metering system. 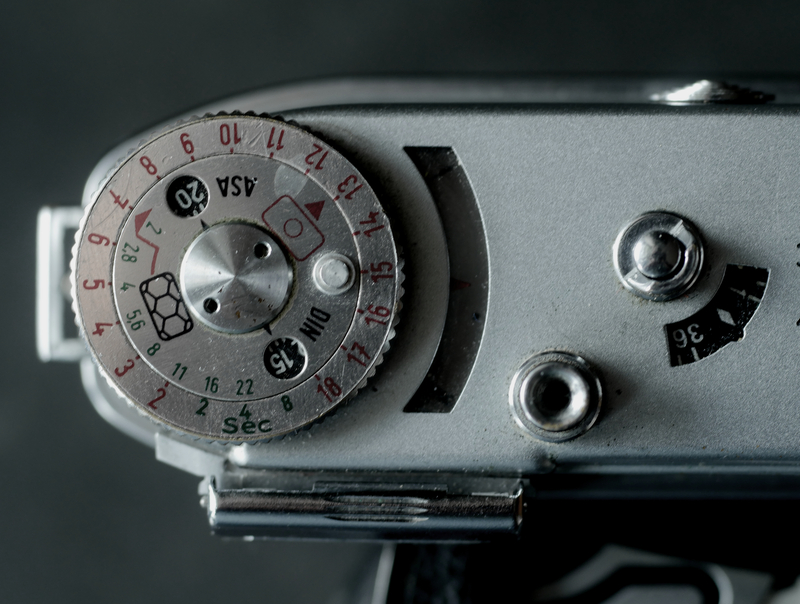 After matching a red pointer with the black meter needle in a window on top of the camera you have to know which one of two marks on the light meter dial you have to refer to for your reading. Once you have mastered this you only have to transfer the indicated number to a scale on the bottom of the lens-shutter assembly and that’s it. With a simple turn of your wrist you can now go through all combinations of shutter speed and aperture that are adequate for a given lighting situation. 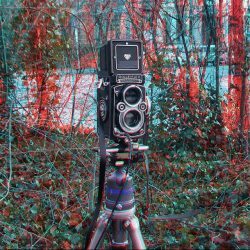 EV(exposure value) system is the name of this simple and efficient mechanical predecessor of modern program shift that was invented in the 1950s by the german shutter manufacturer Friedrich Deckel who also manufactured the Synchro Compur shutter of the Retina IIIc. Some people dislike the EV system, i have grown increasingly fond of it. It is fast and precise and any change of light can be compensated easily by setting one single number, not a combination of two values as with other cameras. And amongst the many photographs i shot with the Retina and its metering system not a single one was heavily under- or overexposed. All things considered the handling of the Retina IIIc is smooth and ergonomically consistent, even though it has its peculiarities and foibles other than the dual range exposure meter i have mentioned before. The most obvious is the unusual location of the film advance lever on the right bottom of the camera, followed by the fact that the exposure counter counts backwards and stops at the number 1. Not a bad thing, really, as you always know how many shots you have left, but when the camera reaches the last exposure it completely refuses to work. You can neither release the shutter nor advance the transport lever before you press a special button next to the counter and move the scale manually to a diamond shaped mark. Having done so you can advance a freshly inserted roll of film to its first picture and start shooting again. Despite these little oddities the operation of the Retina is far from being awkward. 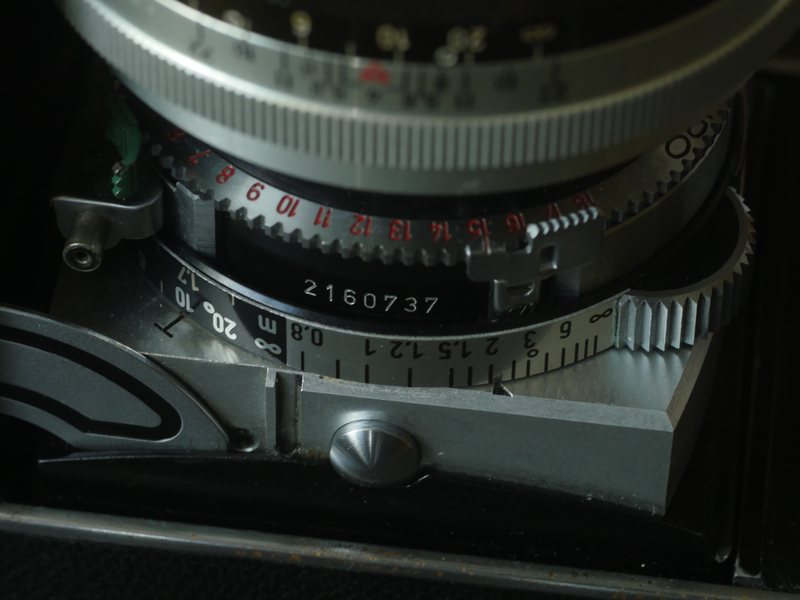 Once you made yourself familiar with the camera’s distinctive features everything falls into place and the IIIc is a pleasure to use. It’s sturdy, it’s elegant und in the right hands it can be pretty fast. Unless … unless you decide to make use of the extra equipment stowed away in your little leather case. Converting the 50 mm Xenon to a tele or a wide angle lens is by far more challenging than exchanging lenses on an SLR or a rangefinder. The extra front elements for the Xenon are not only rather hefty lumps of glass and aluminium (especially the 80 mm tele), they also require an extra allotment of operational attention. Because the focussing mechanism stays with the camera while the focal length of the optical system changes, the distance measured with the rangefinder has to be numerically transferred from the distance scale of the normal lens to one of two secondary scales (one for the wide angle, one for the tele) you only see when you turn the camera upside down. Once this transfer is achieved, you must turn the camera back to the normal shooting position, reframe your picture in the accessory tele/wide angle finder and hope that your subject has not moved in the meantime. A procedure that slows you down quite a bit. A spontaneous street photographer might find that rather cumbersome while others might be grateful for the extra training unit of brain jogging it provides. But as long as you stay with the normal lens – which by the way is very sharp and has a lovely bokeh – the Retina IIIc is paradigm of usability compared with modern cameras like my Lumix GX8. While the latter failed me more than once due to an empty battery and continues to annoy me with its overly complicated menu system, this little 63 years old mechanical marvel just works with reliable simplicity. Another big advantage of the Retina is the fact that nobody takes you serious with that kind of camera. When you lift such an ancient device to your face most people think you are a goofy old idiot who is totally capable of not putting a roll of film into his prehistoric photographic contraption. My outdated appearance as a Retina photographer was massively enhanced by the congenial everready case i bought at Ebay for ten euros. With its shiny brown leather it fits snugly around the camera and makes the combination a pleasure to carry over your shoulder – not to heavy and definitely small enough not to get in your way. In the months that i own it now the Retina IIIC has become my favorite camera to carry with me every day. Walking the streets of Munich, travelling in France or Italy, riding my vintage motorcycle and even when i have to carry a digital camera for professional reasons it rarely leaves my shoulder and reliably transfers my vision to pictures that will last. Likewise in terms of subject matter and meaning. Thank you for appreciating it, Tom. I’m picking one up tomorrow for $15. Wish me luck! Great article. Very good article, thanks. 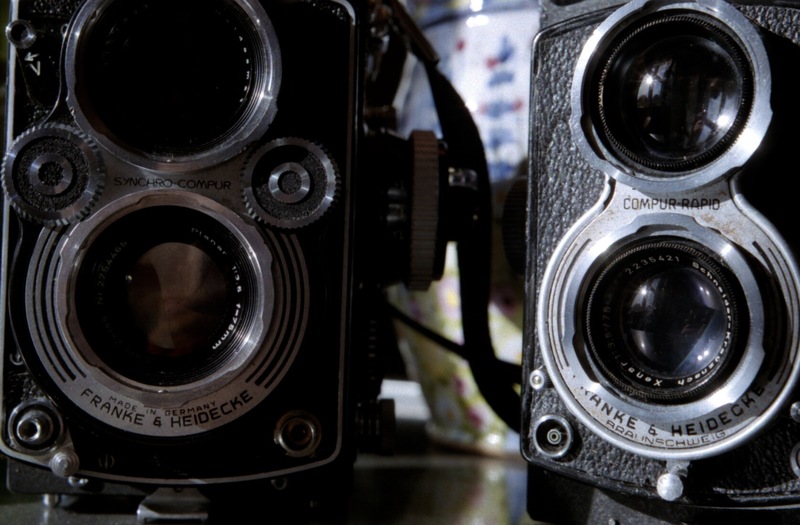 The picture at the top, however, is of a model IIIC (“big C”) while the camera you describe is the earlier model IIIc (“little c”). The big C model doesn’t need the auxiliary finder. Thank you, Richard, you are of course absolutely right. The picture is wrong. I thank you very much for spotting this mix-up and i will make a 360-degree picture of the little c soon and put it in this post. It’s great to have attentive readers like you.